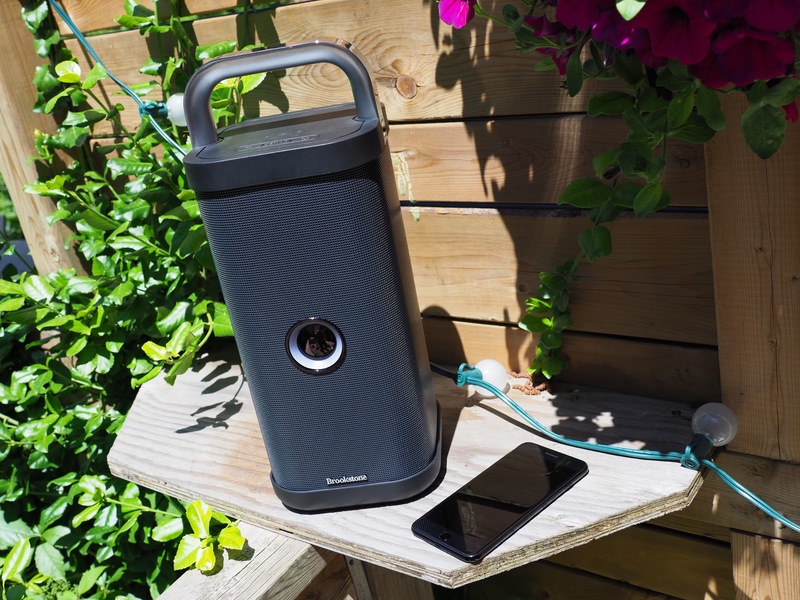 In case a certain recent product unveiling got you hankering for a connected speaker with impressive, room-filling audio performance, you’re in luck: The Brookstone Big Blue Party Indoor-Outdoor Wireless Wi-Fi Speaker is exactly that, and you can buy one right now. Plus, it’s currently available for $249, which is less than the price of that other speaker — even when it does eventually go on sale. The Big Blue Party Speaker is not itself actually blue: It comes in two color options, including light gray and graphite, which roughly match up with Google’s silver and black Pixel phone colors. The speaker is large, standing almost a foot-and-a-half tall, and it’s relatively heavy at 12 lbs. But its size and weight are indicative of its quality in this case, because the solid speaker puts out sound in 360-degrees, and is built for durable use in all sorts of weather, with a water-resistant exterior housing. Given its sound quality and built-in battery, the Big Blue Party Speaker would be a good deal even if it only offered Bluetooth connectivity (hence the “blue” in the name, if you hadn’t guessed). But that’s actually not all that the speaker has in terms of connection options: There’s an auxiliary port for hardwired connections, of course, but there’s also Wi-Fi built-in, which makes it possible to connect with Chromecast devices for multi-room synced audio streaming. This is really the product’s killer feature, and what makes the difference between it and the Bluetooth-only version, which is $50 cheaper at regular price but which lacks Wi-Fi. But the upgrade is worth the cash, as this is one of the only devices out there that currently offers Chromecast built-in, as well as battery power alongside weather-resistant construction. If you’re not already on a Chromecast kick, you should look at the tech again. Google’s streaming layer is now available in plenty of home theater and speaker hardware, as well as in its Google Home speaker. It works with Android at the system level, and with a range of music and podcasting apps even on iOS. With the Google Home app, you can arrange audio Chromecast-enabled devices into groups for multi-room streaming, and performance, in my experience, is very solid and consistent. The Big Blue Party Speaker is likewise a solid performer when it comes to its built-in Wi-Fi and Chromecast connection, at least in my experience. It also indicates when it’s connected to Wi-Fi clearly via simple LEDs located on the top of the device, so you can check visually when you’re ready to start streaming. Set up is a cinch because it’s a Chromecast device, which means you basically plug it in, press the power button (that huge circle in the center of the speaker’s front) and then wait for it to boot. Once it’s fully powered on, you just open the Google Home app on any iOS or Android device, make sure Wi-Fi and Bluetooth are enabled on that phone or tablet, and it’ll appear automatically with a request to set up. When you’re ready to stream, prepare to be really blown away by how good the sound quality is. I wasn’t really expecting this level of performance, to be honest, since I’m a bit of an audio snob with a number of audio receivers and passive speakers, each of which costs more on its own than the Big Blue. The sound is great, however, and truly room-filling, with great upper volume capabilities without any noticeable muddying. The sound here is clear, too, and doesn’t try to disguise flaws through overemphasis of base like so many other wireless audio gadgets. It sounds good outside, too, which is another tricky feat to pull off. This really is the party speaker you’re going to want, especially when it comes to partying in a place where you’ve got a big group and no neighbors to worry about. To put it simply, this speaker is terrific. It’s a great value for the money, even if it costs a bit more than some of the perfectly capable $100 Bluetooth speakers out there, and you get that Chromecast functionality that makes it easy to add it to an existing multi-room setup (or start a new one from scratch). It’s also a great option for Father’s Day, in case you’re looking for a gift that’ll satisfy even the most audiophile father figure.